finished circumference = 21 1/2"
Whoosh! This hat happily reminds me of powder skiing out West. 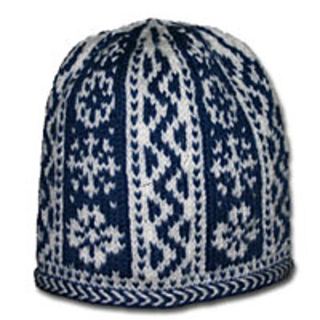 The First Tracks Hat is circularly knit in two-colored stranded knitting to produce an adult-sized hat with a finished circumference slightly over 21 1/2”. 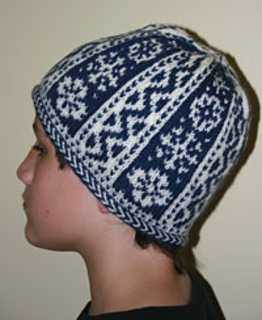 The pattern is appropriate for intermediate knitters and beyond who are familiar with stranded/Scandinavian knitting. Instructions for the “braid” trim (which is actually knit as part of the hat) and the colorized chart are included with the pattern. 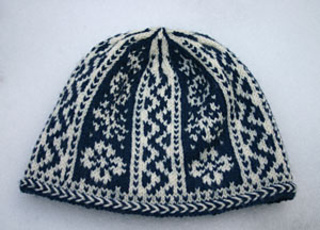 The First Tracks Hat can be knit in Dale of Norway Falk, machine washable, 100% wool, available through the designer here. Choose your two favorite colors!